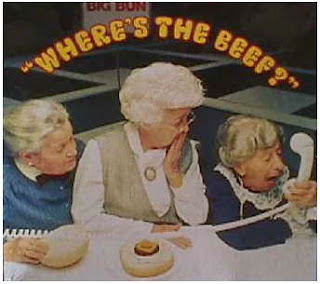 According to Wikipedia, Clara Peller (August 4, 1902 – August 11, 1987), was a retired manicurist and American character actress who, at the age of 81, starred in the 1984 “Where’s the beef?” advertising campaign for the Wendy’s fast food restaurant chain. Clara became a phenomenon asking the all too obvious question. Three months into FY15, there is no budget document whatsoever on the website for the Office of Finance and Administration. Even the budget document from last spring has been removed. Apparently, promises have been made by the administration that a budget will be provided within the next few weeks. The obvious question is “Where’s the beef, I mean budget?” It’s simply incredible that more than 25% of the way through the fiscal year there is no budget for a $200,000,000 enterprise. How can anyone think that, three months into the fiscal year, it is appropriate not to have a budget document available for discussion? Does anyone really believe that the administration is so incompetent that more than 25% of the way through the budget year there is no budget? Not even a “draft” budget? It’s sad to admit but we know that there is a budget—the administration just doesn’t want to show it to anyone. Last spring, the declining enrollment at SCSU had been going on for four years it certainly can’t come of as a surprise. From FY10 through FY14, the FYE enrollment has fallen a staggering 18.0%. SCSU’s $6,400,000 loss on the Coborn’s Plaza apartments has been well documented. The university spent nearly half million on a “branding” makeover. SCSU has been hemorrhaging cash. Little, if anything, has been done about it. President Potter even admits it in a St. Cloud Times article on August 29, 2014! The curious thing about the timing of this article is that President Potter didn’t mention anything about an impending $10,000,000 shortfall, a 5% across the board budget reduction, or a ‘flexible’ hiring freeze in his convocation address nine days earlier. Here is a portion of an August 19, 2014 news release describing his address. To top it off, President Potter held a real ‘feel good’ event after his address. Does anyone believe that President Potter was not aware of the financial situation of the university before his convocation address? If so, his Vice President for Finance and Administration, Tammy McGee, would probably be looking for work right now. Of course he knew! The reason that there is no budget document is because as soon as a budget document is provided, there will be discussion. As of right now it’s only smoke and mirrors about a ‘flexible hiring freeze’ and a 5% across the board cut. Whenever you make a prediction, you typically make a fool out of yourself. Last March 19, 2014, a Silence Dogood article published on the Let Freedom Ring Blog entitled More on State Appropriations ended with the quote “The truth will be evident as enrollment numbers come in for next fall and budget cuts are announced.” I guess Silence got it right. The enrollment debacle President Potter has directed for the past seven years has finally run the “Flagship” of MnSCU aground and a shortfall of $8,000,000 to 10,000,000 is the consequence of his inaction. 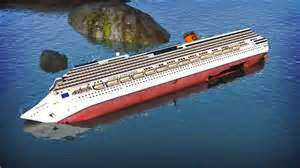 The captain of the Costa Concordia made a bad decision and we saw how well that worked out. Unfortunately, President Potter’s only solution seems to be is to now ask the very people who are going to suffer the most as a result of his decisions to roll up their sleeves and help overcome this latest challenge. Or perhaps he’ll just hire another consultant—it’s worked so well in the past. What could go wrong? Hagan is striking a different chord these days. Locked in a tough reelection battle, the first-term senator boasts that she’s more strongly supportive of airstrikes against Islamic State of Iraq and the Levant militants than her Republican challenger, Thom Tillis, and says she’s been pressing the Obama administration to arm Syrian rebels since early last year. “This is the time for us to come together, Democrats and Republicans, to confront the challenges that are facing our nation,” she said this month. What’s interesting (noteworthy?) is that the terrorists haven’t changed their belief that the infidels must be killed or put into servitude. I’m confident that these doves haven’t changed their opinion of war, either. I’m certain that they’re acting hawkish now…to an extent. Al Franken still doesn’t want boots on the ground, though he wants ISIL defeated. That’s what a focus grouped response sounds like. That isn’t a substantive answer. It’s a political answer aimed at getting him through this election. Without angry men with rifles, ground can’t be take and terrorists can’t be defeated. We don’t need idiots in the Senate fulfilling faux advise and consent responsibilities. That’s what the Democrats are providing and it’s disgraceful. I’m betting that Sen. Hagan couldn’t have explained the definition of getting out of Iraq “in a responsible way” meant then. I’m positive that Sen. Franken can’t explain how to decapitate ISIL without putting boots on the ground. Sen. Franken is a policy lightweight and a political rubberstamp. The only thing more frightening than getting lectured about national security by President Obama is the thought that Al Franken and Kay Hagan are giving President Obama advice on how to decapitate ISIL. These days there is a lot of “if-only-Obama-could-lead-like-Reagan” talk by conservatives. I’ll leave it to historians to figure out years from now who was the better president. But what I’d argue is this: In several critical areas, Reagan had a much easier world to lead in than Obama does now. I don’t need years to decide who the better president was. President Obama is the worst modern president, worse than even Jimmy Carter. Friedman’s argument that “Reagan had a much easier world to lead in than Obama does now” isn’t serious stuff. Obama’s world isn’t tougher to lead. It’s that President Obama won’t lead. It’s shameful, too, that Friedman has forgotten the catastrophe that President Reagan stepped into. During the last half of Carter’s administration, it was fashionable for pundits to talk about how the world had grown too demanding for a president to handle it himself. The fashionable talk then was the need for a co-presidency. Friedman’s column didn’t dismiss this information. Friedman ignored it entirely. When Reagan called the Soviet Union an “evil empire”, doves like Ted Kennedy, John Kerry and Joe Biden criticized Reagan as being utterly naïve. Their opinion was that détente was the only way to manage the Soviet Union. President Reagan emphatically disagreed. President Reagan was right. The chief reason why Friedman can look back and say that President Reagan had it easy is tied directly to the quality of President Reagan’s decisions. In hindsight, it’s easy to see the wisdom of President Reagan’s strategy. President Reagan’s strategy was revolutionary and contrarian to everything that the establishment thought. The Soviet empire couldn’t be defeated, the realists told us. President Reagan will get us into WWIII with that Neanderthal thinking, they told us. President Obama’s world is complicated, too, partially because his attachment to a failed ideology has informed him that being liked is more important than being feared. President Obama said that his administration’s first responsibility was to end wars, which sounds great until you think things through. George Will recently said that the fastest way to end a war is to lose it. President Obama unilaterally repeatedly declared that war will be part of the past during his 2012 campaign. ISIL didn’t get the notice. Shortly after 9/11, a reporter told Mayor Giuliani that, on 9/11, terrorists declared war on the United States. Giuliani’s response was that that isn’t true, that terrorists had been at war with the US for years, if not decades. It took 9/11 for us to finally confront the terrorists. Obama’s world is different. It is increasingly divided by regions of order and regions of disorder, where there is no one to answer the phone, and the main competition is not between two organized superpowers but between a superpower and many superempowered angry men. On 9/11, we were attacked, and badly hurt, by a person: Osama bin Laden, and his superempowered gang. When superempowered angry men have more open space within which to operate, and more powerful weapons and communication tools, just one needle in a haystack can hurt us. President Reagan understood the importance of confrontationalism in fighting the Soviet empire just like President Bush understood the importance of confronting terrorists in their sanctuaries. It isn’t that Reagan had it easy. It’s that he knew what he was doing. President Obama doesn’t know what he’s doing. That’s the chief difference between presidents. BRIT HUME: An American Muslim convert with a Facebook page that could have been written by Osama bin Laden himself chops off the head of a former coworker. Workplace violence, says the FBI. American warplanes bomb a previously little known terror group called Khorasan. The raid is carried out under the president’s legal authority to attack on his own when there is an imminent threat. And who is this suddenly imminently threatening Khorasan? It turns out to be an al Qaeda cell populated by people who belong to what the administration likes to call core al Qaeda. You remember core al Qaeda? That’s a group Mr. Obama has claimed was decimated. The president says America underestimated the threat from ISIS, formerly known as al Qaeda in Iraq. And who did the underestimating? Why it was National Intelligence Director Jim Clapper and his colleagues. Mr. Obama told 60 Minutes Clapper has acknowledged as much. Today, though, Obama spokesman Josh Earnest, as you heard, says the president was not trying to blame Clapper. How did we ever get that idea? What is happening here is simple. President Obama badly misjudged the strength and resilience of America’s terrorist enemies and has adopted a foreign and military policy that has allowed them to regroup and resurge. Now we can see the chickens coming home to roost. The administration would like us to think we are seeing something else. BAIER: What do you make of this intelligence failure that the President talked about on 60 Minutes? HUME: Two big cities in Iraq that had formerly been the focus of our activities in the past, especially Fallujah. So you think it might’ve dawned on someone in the White House, especially the President, that, gee, this little terrorist group is turning out to be much more of an army than we’ve ever seen before, doing things that usually only armies can do, that is, capturing and holding territory, maybe we ought to worry about them. It isn’t that the intelligence community got it wrong. It’s that the things they told President Obama didn’t fit into President Obama’s script that “core al-Qa’ida” had been decimated and that the war on terror was coming to an end. Apparently, ISIL didn’t get the script. Apparently, they’re interested in establishing a nation of terrorists that’s funded with revenues from black market oil and equipped with American military equipment. If President Obama had taken terrorism seriously, he wouldn’t have pulled all US troops from Iraq. He would’ve kept enough boots on the ground to a) prevent ISIL from re-taking Fallujah and b) gather intelligence on terrorists. This wasn’t the intelligence community’s failure. ISIL is the product of President Obama’s willful ideological blindness. His fierce opposition to war and his insistence that the world was working out just as he’d predicted led to this predictable failure. The Analytics and Institutional Data Research Team just released their first HuskyData newsletter. 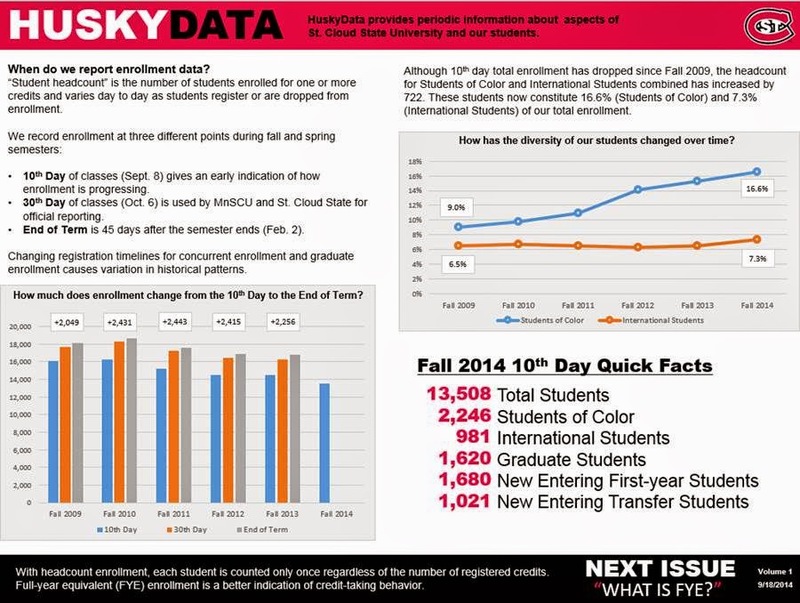 The focus of the HuskyData newsletter is “a regular newsletter dedicated to sharing data and information about SCSU and our students.” Sharing data is clearly important if the goal is transparency. 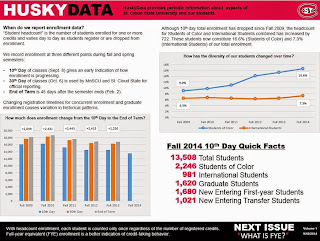 The first issue of HuskyData lists some of the reporting of data by the university and MnSCU. The thrust of the first graphic focused on headcount. It shows that the headcount enrollment increases from the 10th day to the 30th day to the final enrollment. While this is certainly true, it completely misses the important point that whether you look at the 10th day, the 30th day, or the final enrollment, the numbers are declining significantly! Even looking at the final headcounts for Fall 2010 and Fall 2013, it looks like a drop of 2,000 in headcount. A second major point is that the numbers for the 30th day headcount enrollment and final headcount enrollments increase as a result of the reporting of the enrollments in the Senior-to-Sophomore program (S2S). If you look at enrollments at Winona, which does not participate in the S2S their 10th day, 30th day and final enrollments are very nearly the same. A third major point is that the explosive growth in headcount enrollment due to the PSEO program, which includes the traditional on campus PSEO and concurrent enrollment high school courses, masks the decline in the headcount enrollment of ‘regular’ students. 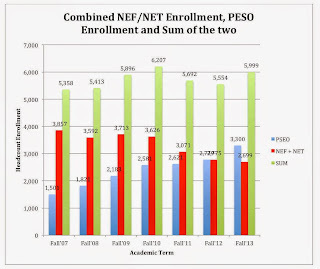 The figure below shows the New Entering Freshmen (NEF) and New Entering Transfer (NET), the PSEO enrollment, and the sum of the two. Looking at this figure, it is clear that the overall headcount enrollment is increasing or at least from Fall’10 to Fall’13 is down only very slightly. The most egregious issue of this plot is that if you look at the final enrollments for FY12 and FY13, it looks like they are very nearly the same. The plot is small and there are no data labels listing the values (even if there were you would not be able to see them). 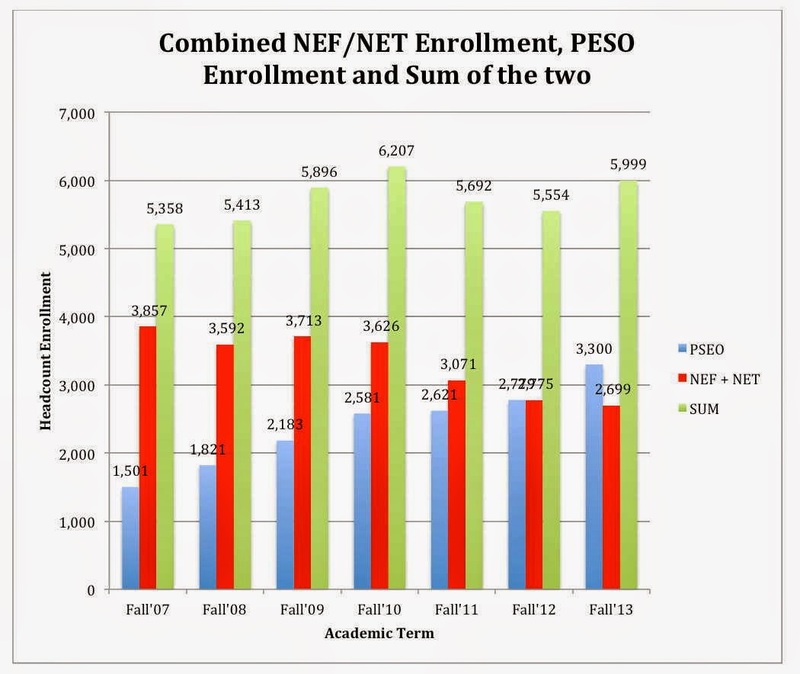 However, even if the headcount for FY12 and FY13 was nearly the same, the actual FYE enrollment fell 284 students. An estimate calculated using information reported by Bruce Busby at the most recent Budget Advisory Group meeting is that each FYE lost represents a loss of $11,258 in tuition. As a result, a loss of 284 FYE therefore represents a decline in revenue of $3,197,400. HuskyData is a clear example of why headcounts don’t mean much except for bragging rights for university presidents. I think a lot of Minnesotans don’t know what Jeff Johnson stands for. It seems like schools are not Jeff Johnson’s priority. Jeff Johnson cut early childhood spending. That really bothers me. Any cuts to that would be devastating for our family. Our kids are our future so how could you do that? I would hate to see Minnesota take a step backwards in education. Students in the state of Minnesota deserve far better than that. I trust Mark Dayton. We think Gov. Dayton is the right choice for moving Minnesota’s schools forward. Now that ad, which is paid for by the Alliance for More Powerful Unions, aka the Alliance for a Better Minnesota, is running constantly. I said in the original post that everything in the ad was about spending. It definitely didn’t focus on teacher accountability. I doubt that many Minnesotans object to the thought of having qualified teachers in every high school classroom in Minnesota. The only people who’d object to that are Education Minnesota, Gov. Dayton and Zach Dorholt. That isn’t a cheapshot, either. In 2011, the GOP legislature passed a bill requiring high school math and science teachers to pass a basic skills test. Gov. Dayton signed that bill. After the 2012 election, and with an all-DFL government in St. Paul, Education Minnesota called in their biggest chit. Education Minnesota told the DFL legislature and Gov. Dayton that the basic skills test had to be repealed. ASAP. Despite their public statements, Education Minnesota isn’t about putting highly qualified teachers in every classroom. Education Minnesota is about representing the best interests of their members, nothing more, nothing less. The tip that voters should notice is the couple saying that they trust Gov. Dayton. What they’re saying is that they’re either steadfastly pro-union or they’re totally uninformed voters who’ve bought the Dayton campaign’s spin. Though the ad touts Gov. Dayton’s support of Education Minnesota, it could tout Zach Dorholt’s support of Education Minnesota. When it comes to supporting everything on the public employees unions’ wish list, nobody gets higher grades than Zach Dorholt. Or Gov. Dayton. Or Speaker Thissen. Or Mike Nelson. Or any other DFL legislator. The reality is that the DFL legislature is a subsidiary of the special interests. As the PAC chair of the Minnesota Association of Professional Employees, I am concerned former House Rep. Jim Knoblach used our name in campaign fliers, such as the ones labeled “Past Support”, which insinuate he has our support today. I don’t know how MAPE union members think but I know how normal people think. When normal people hear the term past support, we don’t think that means a candidate currently has MAPE’s support. If a candidate is endorsed by a union or a business trade organization, they highlight the fact that they’ve been endorsed by that organization this year. Our union represents more than 13,000 state employees. We hold elected officials to high standards, and we don’t take our endorsement process lightly. Actions speak louder than words and House Rep. Zach Dorholt has acted in the best interest of our members. Dorholt has a 100 percent voting record on MAPE issues. Team MAPE supports MAPE friendly candidates and legislation. Our issue priorities include: achieving fair compensation for state employees, fixing our broken health care system, preventing outsourcing and privatization of state services and protecting our pension and retirement benefits. Team MAPE is supported by the MAPE Government Relations Committee and MAPE Political Action Committee. The MAPE GRC and MAPE PAC work hand-in-hand to advance MAPE’s political and legislative strategic priorities. We achieve these goals by assisting the election of MAPE allied candidates and influencing the legislative process through lobbying and grass-roots action. In other words, MAPE works hard to elect politicians committed to taking money from the private sector to grow government. Whenever MAPE elects a pro-government politician, MAPE gains another politician beholden to their causes. Based on MAPE’s definition, they just said that Zach Dorholt will represent MAPE’s interests, not his constituents’ interests, 100% of the time. That isn’t surprising considering the fact that Dorholt hasn’t raised any money from inside his district. He’s bought and paid for by the special interests that knock doors for him and help get out the vote for him. Zach Dorholt’s nickname should be MAPE’s representative. He definitely didn’t represent this district in the legislature. Jack distributed the document presented by the administration at the Budget Advisory Committee last spring showing that Coborn’s Plaza Apartments lost $6.4 million in the first four years of operation. In light of anticipated losses over $1 million per year, two mothballed dorms with a capacity of 779 students, and an $8-10 million dollar shortfall for FY15, the need to make a decision about continuing in the contract with the Wedum Foundation, the decision to leave Coborn’s Plaza needs to be made before the end of the year or the university will not be able to leave until the end of the 2025-26 academic year. MSP (Susantha, Tony) Recommend giving notification of termination to the Wedum Foundation. (unanimous). Hopefully, the lease could be renegotiated to account for the amount of money coming in to the university. A reduction of $1 million per year in the lease payment would save a significant portion of the $8-10 million dollar shortfall without negatively affecting academic programs. I can’t picture President Potter following the Committee’s recommendation. In his mind, admitting that he’d made a multi-million dollar mistake is admitting failure. That isn’t my opinion. That’s what President Potter said at a Meet & Confer Meeting. To those that have watched him, they know that President Potter won’t admit that he’s failed to spend the University’s money wisely. President Potter will still insist that the Wedum apartments lease is a great decision by his administration. That defies logic. It’s one of the worst financial decisions in SCSU history. That isn’t hyperbole. I defy anyone at SCSU to name a worse financial decision. If it isn’t the worst financial decision, then it’s certainly in the top 3. When President Potter signed the contract, he said that a survey showed a market for upscale apartments. At the time, the apartments were going to be exclusively occupied by upper classmen. The last year that they have occupancy data for, the apartments were about 70% full with asterisks. The apartments aren’t just for upper classmen. Any SCSU student that’s able to pay the rent is eligible to rent the apartment. In fact, the apartments aren’t just for SCSU students. Students from St. Cloud Technical and Community College (SCTCC) live in the Wedum Apartments. That’s before factoring in the fact that 2 dorms on the SCSU campus have been mothballed and another dorm was remodeled. Whoever did the survey that purportedly showed SCSU students wanted upscale apartments shouldn’t have any credibility. Building high-priced upscale apartments for college students during the Great Recession doesn’t make any sense. That’s like saying the Titanic needed a second iceberg. Thanks to President Potter’s financial mismanagement, SCSU is facing one of the biggest budget shortfalls in MnSCU history. In light of that, the mention of the Titanic seems fitting, especially considering the fact that President Potter once served in the Coast Guard. Throw in SCSU’s sinking FYE enrollment and the Coast Guard/Titanic metaphor fits perfectly. It isn’t likely that you’ll hear Denise Specht criticize Jeff Johnson’s plan to audit every government agency, though you might hear Specht rail against teacher testing. Scott Leitz isn’t publicly complaining about Jim Noble’s audit of MNsure but that’s mostly because whining about it won’t sit well with the public. MNsure is a mismanagement disaster. The website doesn’t work. The vast majority of health insurance renewals through MNsure will be processed manually. Most importantly, MNsure is costing Minnesota’s taxpayers untold millions of dollars by putting children on Medicaid whose parents make too much to qualify for Medicaid. There’s even proof that the Minnesota Department of Human Services knew about this but didn’t fix the problem. The Department of Human Services also isn’t doing oversight on the nonprofits it’s giving grants to. That’s why Community Action Partnership of Minneapolis shut its doors. It didn’t help that politicians like Jeff Hayden and Keith Ellison didn’t pay attention to how Community Action was misspending tens of thousands of dollars on cruises, spa treatments and weekend getaways. The last thing a bureaucrat wants is accountability from his or her supervisor. They just prefer getting their agency’s budget increased each year without being audited. That’s why they fought hard against creating King Banaian’s Sunset Advisory Commission. Jeff Johnson is a bureaucrat’s worst nightmare. He’s actually highlighted governments when they foolishly spend the taxpayers’ money. Football fans know that offensive linemen don’t get noticed until they commit a penalty or until the man they’re supposed to block hits the quarterback. The principle is the same for bureaucrats. They aren’t noticed until they’re caught in a scandal. Jeff Johnson isn’t opposed to government. He’s part of it. He’s just opposed to government that opposes accountability. He’s opposed to that type of government thinking because it bothers him when the taxpayers’ money isn’t spent wisely. Like most DFL politicians, Gov. Dayton doesn’t pay attention to how money is spent. When Jeff Johnson first said that government agencies should be audited, Gov. Dayton criticized Commissioner Johnson for essentially stereotyping people who receive government assistance. When KSTP discovered that Community Action Partnership of Minneapolis was spending money on cruises, spa treatments and weekend getaways, Gov. Dayton’s tune changed instantly and dramatically. I don’t want a governor who specializes in cleaning up messes after the fact. I’d prefer a governor that puts policies in place that prevent messes from being created in the first place. Over the years, there have been numerous calls for reducing the number of institutions of higher education in Minnesota. With the creation of the MnSCU bureaucracy, mergers significantly reduced the number of independent entities without real reductions in capacity. However, as the number of high school seniors has declined over the past few years, there have been additional calls for real reductions. While it is true that enrollments in MnSCU institutions have declined over the past few years, not all have declined by the same amount. 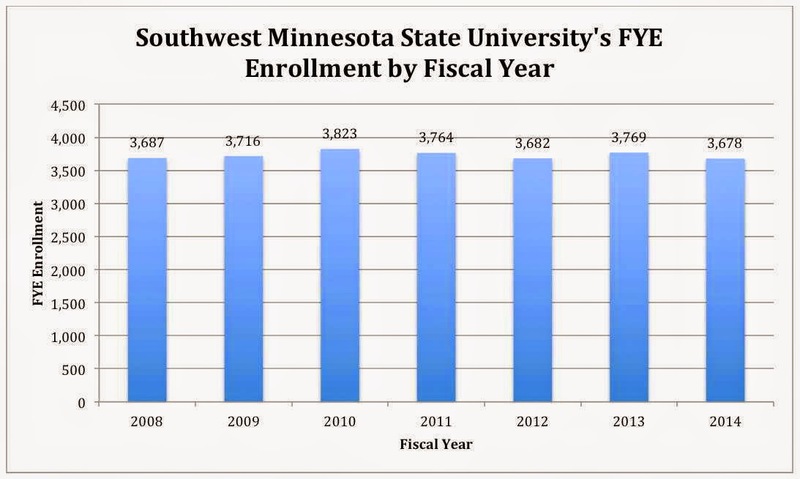 The following figure shows the FYE enrollment at Southwest Minnesota State University from FY08 through FY14 (Data from the MnSCU website). The enrollment for FY14 was down 2.4% from the previous year, but is only down 0.2% from FY08. The enrollment for FY14 is down only 3.8% from its high in FY10. One might easily argue that Southwest’s enrollment has been essentially constant given small natural variations. 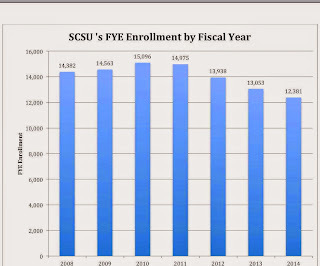 The enrollment for SCSU from FY08 through FY14 is shown in the following figure (Data from the MnSCU website). Clearly SCSU’s trend is very different than Southwest’s. 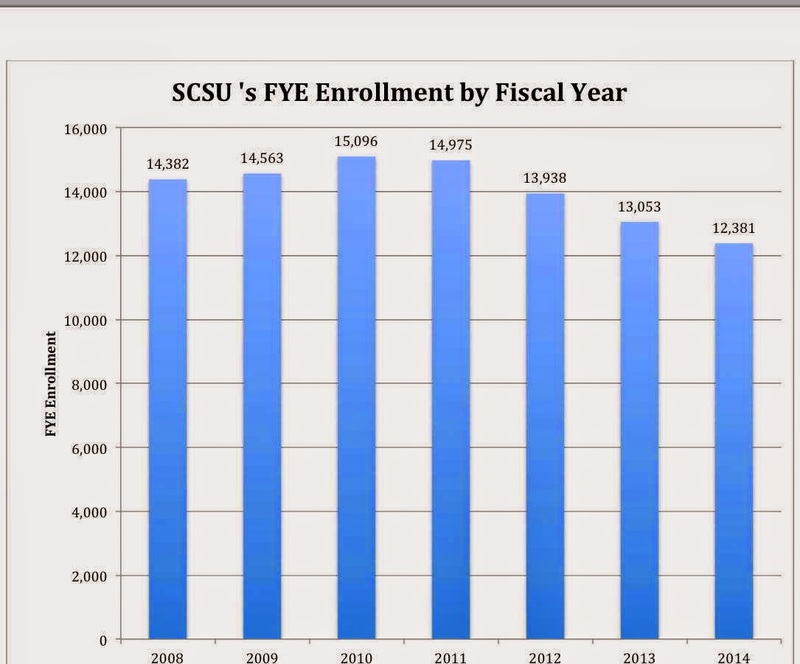 After increasing from FY08 to FY10, from FY10 to FY14, SCSU’s FYE enrollment dropped 18.0%! Clearly, there is a difference between an enrollment decline of 3.8% and 18.0%. The enrollment data for summer for FY15 is in and SCSU’s FYE enrollment was down 9.4%. Although the administration in March originally planned for a 3.2% enrollment drop, the administration has recently projected a drop of between 4-5%. However, one source has said that the administration expects the number to be closer to 5.5%. Assuming that the enrollment drop is the mid-point of the projections at 5.0%, SCSU’s FYE enrollment for FY15 will be 11,761. This would represent a drop from FY10 of 3,335 FYE, which translates into a decline of 22.1%. The total enrollment at Southwest in FY14 was 3,678 FYE, which means that if SCSU loses an additional 343 FYE, SCSU will have lost more enrollment that the total enrollment at Southwest State University! Consider the economic loss to Marshall and the surrounding community if Southwest were to close. Essentially, SCSU has lost almost that same amount of economic impact on greater St. Cloud. According to SCSU’s current projections, SCSU will lose 619 FYE from FY14 to FY15 so if SCSU loses 2.9% enrollment in FY16, SCSU will have dropped more than the total enrollment at MnSCU’s smallest university. Last March, the Data Analytics Group at SCSU projected a drop in enrollment for FY15 of 3.2%, which has now been revised significantly upward. They also projected a 2.3% drop for FY16. Since the projection for FY15 was a gross underestimate of the enrollment decline, confidence in the projection of 2.3% drop in FY16 is certainly suspect. As a result, it is beginning to look like the milestone of the enrollment loss at SCSU being equivalent to closing MnSCU’s smallest university will be reached during the next fiscal year. This is probably not a milestone President Potter will list on his resume. Now there are, of course, those who say that it’s just demographics so there is not much that can be done. 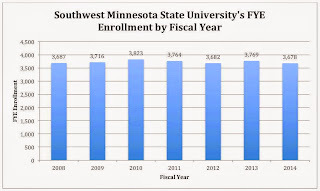 However, enrollment at Southwest has not experienced the kind of enrollment drop as SCSU. Additionally, Minnesota State University—Mankato, which is SCSU’s historical rival has also not seen the same declines. 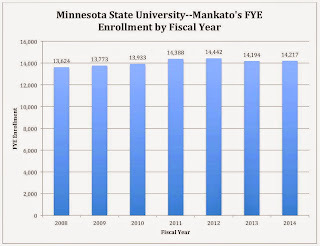 The following figure shows Mankato’s enrollment from FY08 through FY14. It’s pretty easy to see that the trend at Mankato is very different than that at SCSU. 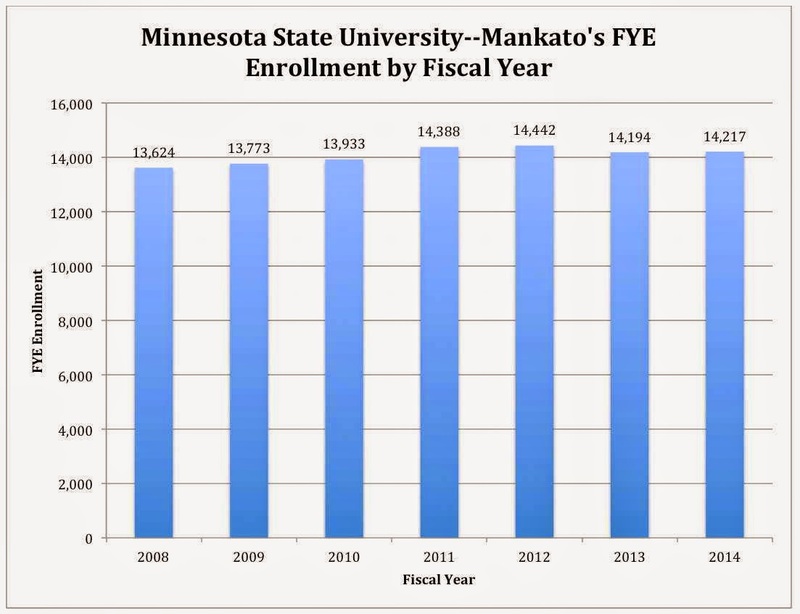 For FY14, MSU—Mankato’s enrollment was actually up! For this academic year, the Mankato administration is projecting a growth of 0.4%. Certainly not huge but certainly better than a decline of 5%! So perhaps the calls for the closing of a MnSCU university will cease because in ‘right sizing’ SCSU President Potter has singlehandedly taken care of the problem. However that still leaves empty and underutilized buildings and duplication of the cost of administration and other non-instructional costs to operate a university. Perhaps Potter’s ‘right sizing” has just created another problem for MnSCU and the state?